A couple of years ago Battlelog.co, which is powered by the Revive network, provided a way to play Battlefield 2 after the central GameSpy servers went down. Now, you can download the entire game, including expansions, for free from Battlelog.co, and play as much as you want. Just over a week ago, they released the full version, including expansions, of what I believe is the best Battlefield game ever released – Battlefield 2142. The whole lot is also free – you don’t have to pay for the game. Just create an account, download the launcher, and download the game. The servers are already there for you, and the launcher lets you download both or either game. This is old news though, so why write about it? In my opinion, what Battlelog.co has done highlights the best side, and worst side, of DICE. Battlelog.co has released Battlefield 2, Battlefield 2142, and all their expansions, for free. Unlike Lucasfilm, who stopped a fan-made Star Wars game from being created, DICE has allowed Battlelog.co to release BF2 and BF2142 for free (I would also imagine there has been some behind-the-scenes communication as well). This is a great move by DICE; they’re essentially helping and clearing the way for our community to continue to play what many believe are the best versions of this franchise. A nice touch, and something that is heartening to see. But if that highlights the best side of DICE – supporting its community in its desire to continue to play older games – it also brings into sharp focus what DICE is doing right now with Battlefield 1. The fact we could host our own servers in BF2 and BF2142 is what has allowed Battlelog.co to revive those two games. The later generations of Battlefield games, including Bad Company 2, have not allowed us to host our own servers – we’ve had to go through DICE-approved server providers. So unless someone gets hold of a Battlefield 3 server exe, what’s been done for Battlefield 2 is not going to be done for Battlefield 3 and later games. It’s this gradual erosion of trust in its playerbase, and continuing removal of player options, that is highlighted by what Battlelog.co has achieved. The latest step in DICE’s constrictive process appears to be their move to remove any choice in where we rent our servers from for Battlefield 1. By all indicators it’s going to be DICE who is the PC game server provider for BF1. And it also looks as if they’ve even removed the ability for admins to use 3rd party tools such as ProCon to admin servers. I released a video on this a couple of weeks ago, and it’s linked at the end of this post. This is where the dichotomy comes in. How can a company which supports its community so that they can continue playing its older games, move in such a totally dictatorial direction with its new games? How can a company which gave us the genre-defining Battlefield series, and support its community in playing those older games, then remove so much of what made the franchise what it is in the first place? I understand the cost of each generation of games is increasing rapidly. DICE has hardly been able to increase the base cost of the game, hence the reason for other revenue streams such as Premium and server rentals. But they don’t need to carve out a large part of the reason many of us play just to achieve a certain $ return. Dumbing this game down to the lowest common denominator, which is precisely what we’ve been accusing the CoD franchise of trying to achieve over the years, will simply remove that section of the community which has helped build the game to where it is now. Perhaps the senior folks at DICE need to take a look at ARMA 3, or if they do not want something quite so complex, then they should cast their eyes over Squad. In fact, Squad was made by the same team that made the Project Reality mod for Battlefield 2. Today they would not be able to do that, because DICE does not allow modding of its games. Is there any better example of how far DICE has fallen than that? Are Games Simply Worse Than They Used To Be? One of the amazing creations from the incredibly gifted Pawel. Many years ago I used to be able to sit down for hours on end and simply game. Every so often I’d put aside an entire weekend just to play my current favourite addiction: no chores, no family, nothing but gaming. Oh how I looked forward to those times! But for some years now nothing has grabbed my attention in that way. I’ve not had that buzz you get when a new game comes out and You. Just. Cannot. Get. Home. Fast. Enough. To. Play. It. So that got me thinking: are games simply getting worse? Have game designers run out of ideas? Do larger publishers rely too much on sequels rather than looking for that next big thing? If I can still regularly find new music (thanks Spotify!) that excites and moves me, then why can’t I find new games, the form of media entertainment I prefer above all others, that do the same? There is some justification for laying part of the blame at the feet of the Activisions of the world. After all, the dominant FPS right now is Call of Duty, a poster boy for sequels if ever there was one. But is that really the publishers fault, or are we, the customers, to blame? CoD’s core audience are the same people who come back year after year, looking for a refreshing fix of their favourite franchise. And since the ultimate power to force publishers to do what we want lies with us, then purchasing sequels just reinforces the publisher’s bad habits. To be clear; publishers go where the money is – if it’s in sequels, then that’s where they’ll be. Sometimes the larger publishers will try new formulae. 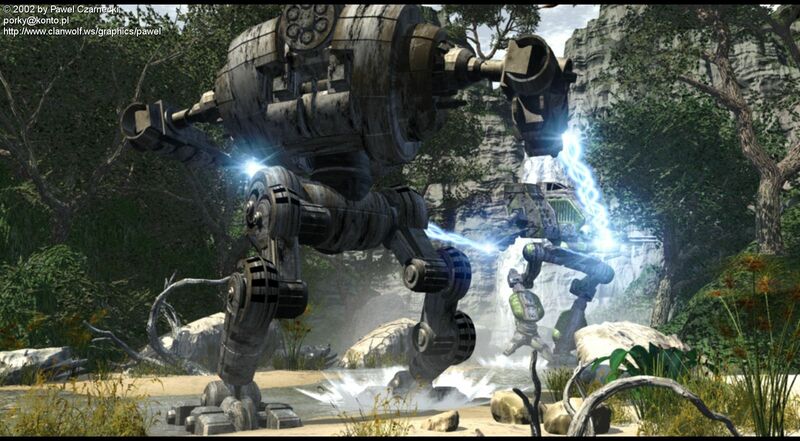 Titanfall was a game I was hoping would be The Next Big Thing. Infantry and mech combat in a fast-paced game from a top publisher with a AAA budget. Hallelujah! Unfortunately it did not live up to its hype (although it was far from poor). A free weekend spent with the game and I’d had enough. To put that in context, when MechWarrior 4, which is another mech game, came out in 2001, I spent two years solid getting up at 4am to play with my Euro and American buddies. In fact the guy who made the image on the top left of this post inspired me to spend several years modelling, texturing and animating mecha. 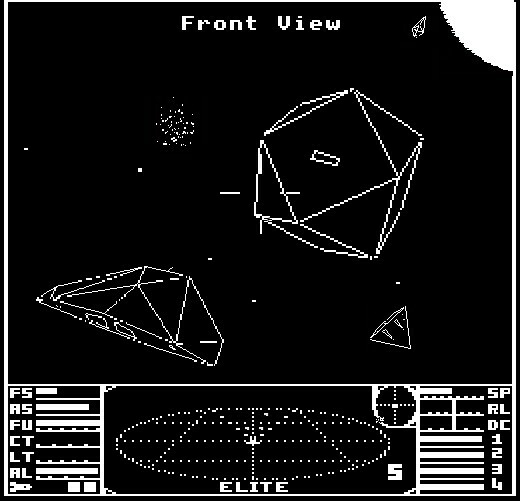 Elite, a game from the early 80’s. That leaves the smaller publishers and indies. There are a wide variety of games that have, and continue to be, created by this dynamic group. Steam’s Early Access gives some of them access to the funding they need and deserve, and Kickstarter can also be a great place for funding (just ask the Exploding Kittens guys). Many of these games are great, and I’ve tried quite a few, but again none have caught my eye across a bar, winked seductively and literally tied me up for several weeks until I’m too exhausted to carry on. If the spark ain’t there, then it just ain’t there. All of which leaves me in a quandary. If there are more games available than ever before, with at least the indies really pushing the edges of what you can call “a game”, then why am I so jaded? After more than 30 years of gaming, with more disappointment than elation from games that have promised so much yet delivered so little, I’ve come to the conclusion that my standards are now so high a game would have to be virtually perfect to really grab me like MechWarrior 4 or Battlefield 2142 did. Epic doesn’t even come close to describing those games, they had an indefinable quality that hooked me and kept me wanting more. Not only do today’s games not measure up, but they have to compete with the rose-tinted spectacles effect. I remember that BF2142’s launch was a screw up of magnificent proportions – as was BC2, BF3, BF4….you’d think DICE would have learned their lesson by now. But despite that I can forgive BF2142 because it was just so frickin perfect. The later games were not, especially when measured up against BF2142. As for MechWarrior Online, the latest installment in the MechWarrior franchise, meh it just does not match up to its predecessor. Even the fan-made and very brilliant MWLL was better. So maybe this is a challenge to development studios – and I include the studio I work for in that shout out – to make games that hook and cajole and wink and seduce just like games used to. Make something different, make something fun, make something that’ll appeal, and in return I’ll take off those rose-tinted spectacles and put them here to one side.